Free scenic drives provide some of the best budget travel values available. A breathtaking variety of vistas and views can highlight your stay in a new destination. Among the most famous of these routes is California Highway 1. Start this free scenic drive anywhere you like, but Pismo Beach makes a strong departure point and provides immediate access to California 1. Don't expect to make good time. 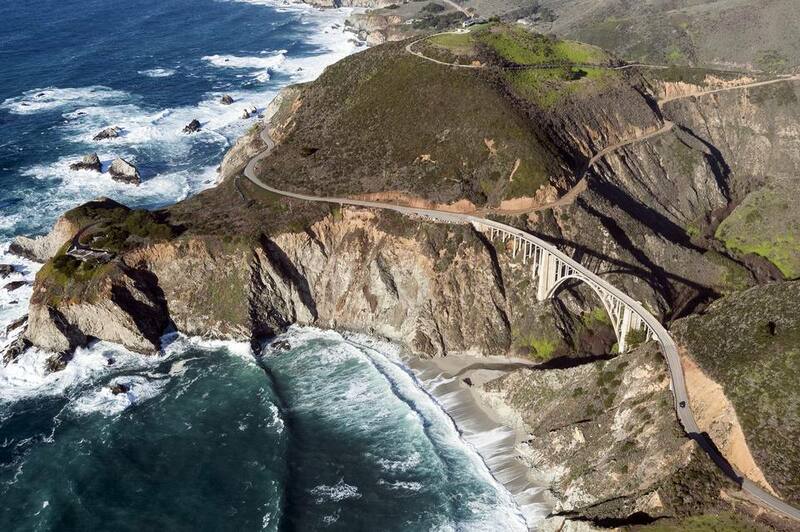 This 145-mile drive will take more than three hours if you make no stops. But you'll want to make a lot of stops. You'll pass through unique places like Morro Beach, the Hearst Castle and Big Sur Beaches en route to Carmel. There are scenic overlooks you won't want to miss, and curving, cliff-hugging stretches where you'll slow to a crawl. But there are no deadlines here and no toll booths. Spend at least a day enjoying one of the finest driving experiences in the world. Near Carmel, you'll encounter the famous 17-Mile-Drive, but it's a toll road. Loch Ness is famous for "Nessie," the legendary monster that supposedly inhabits the deep waters of this lake south of Inverness. But the area has much more to offer than the possibility of a monster sighting. The picturesque villages of the Scottish Highlands, hiking opportunities and even the ruins of a castle await you. Travel south B862 road, which is also marked as Loch Ness Trail. At about 14 km., take the fork to the right, which becomes B852 and hugs the eastern shore of Loch Ness. At Ft. Augustus, you'll reach the southern tip of the lake. Turn north on A82, which goes back alongside the opposite shoreline. Uruquart Castle and Drumnadrochit are possible stops on the way back to Inverness. U.S. 101 on the Olympic Peninsula, Wash.
U.S. 101 circumnavigates the mountainous, scenic Olympic Peninsula west of Seattle. Small sections pass through the national park of the same name, and if you decide to visit park sites such as Hurricane Ridge or Quinault rain forest (as you should), you will have to pay the park entrance fee. That fee pays for a lot of good things, and personally I have no problem contributing to the health of the U.S. national park system. But the title of this story includes the word "free," so it must be pointed out that it is also possible to travel U.S. 101 and simply enjoy the the sites and the sunsets over the Pacific. It is therefore a free scenic drive. Hotel selections include the Kalaloch Lodge and Alderbrook Resort and Spa a few miles off 101 at Union, Wash. Arriving and departing Monteverde, Costa Rica can be quite a challenge. As in much of Costa Rica, roads are narrow, unpaved and wind around some mountainous terrain. But thousands of tourists make the perilous trip each year so they can see the Monteverde National Park Cloud Forest. Visitor totals could go much higher if the government paved the roads, but there is a desire to keep the crowds manageable. When you travel between Juntas (near the junction with the Pan American Highway) and Santa Elena, you will see ox carts and cyclists negotiating the rough road. But if you pull over and enjoy some of the vistas, it's easy to forget about the pot holes. Views of the Gulf of Nicoya, plantations and green, cloud-topped mountains are your reward. While it's true that the scenic Desert View Drive running along the south rim of the Grand Canyon is more widely known, you must pay an admission fee to the national park on all but a few days each year before you drive on it. About two hours to the south, there is another spectacular journey you can travel for free: Scenic Highway 89A. Instead of the Grand Canyon, you'll be enjoying Oak Creek Canyon. As you move to the north, you'll gain altitude until you reach about 6,400 feet above sea level at Oak Creek Vista. The section from Harding Springs to the vista features a number of hairpin turns and can be dangerous in bad weather. Your best chance for finding budget lodging is just a few miles to the north of Oak Creek Vista in the city of Flagstaff. Consider combining this great drive with a visit to the Grand Canyon. In America's busiest national park (about 9 million visitors each year), this highway gets lost in the shuffle and is unknown to most visitors. In fact, some Tennesseans view the Foothills Parkway as a failed road project. Only about a third of the intended 71 mile drive has been completed after decades of planning. Good news: two sections do exist, and they provide a "back door" view of Great Smoky Mountains National Park. Foothills Parkway is a free scenic drive allowing access without the endless souvenir shops and theme parks you encounter in other places. The eastern section begins at exit 443 of I-40 and continues to Cosby, Tenn. The western section stretches from U.S. 129 along Chilhowee Lake to U.S. 321 at Walland, Tenn. Along the way, enjoy hiking and overlooks. It doesn't have to be Fall foliage season to enjoy driving route 112 between the New Hampshire towns of Lincoln and Conway. This 34-mile route runs through the White Mountain National Forest, and there are waterfalls, hiking trails and other natural wonders to explore. During the fall, the drive could be quite busy but the rewarding autumn views around each turn will make up for any congestion that might develop. You'll be glad it's free and that you invested time to seek out with the strange, hard-to-pronounce name. When tourists think of driving in Germany, they tend to think about racing across an autobahn at 160 m.p.h. Bavaria's Romantic Road provides slightly less adventure, but perhaps a more memorable experience in the long run. This area of Germany was spared some of the war damage seen in other parts of the region during World War II. So there are well-preserved medieval towns and architecture here that's hard to find in such abundance anywhere else. The most popular stop is Rothenburg. This walled city provides a look at life in centuries past. Frankly, some of it has become quite touristy, but if you can block out the t-shirt shops and concentrate on architecture, you'll be fine. The picture above was taken at the opening of the historical Rüthen Feast in the town of Landsberg am Lech. The feast occurs every four years to celebrate the city's history. Other cities worth a stop along the way include Dinkelsbühl and Augsberg. Don't forget the old city sites in Munich. Trans-Canada Highway between Revelstoke and Golden, B.C. Those who stop in Canada's national parks must pay for the privilege. But Canadian law allows you to pass through the parks without paying the fee. That fact permits this stretch of road to be included in a story about free scenic roads. But don't miss the national parks. Stop, pay the parks fee, and then enjoy the astounding scenery. From Fayetteville, home to the University of Arkansas, make an eastward turn onto state highway 16. The hustle and bustle of Arkansas' second-largest metropolitan area quickly fades as you approach the Ozark National Forest. Pick up Arkansas 23 south at the town of Brashears and you can still enter I-40 with its steady stream of trucks and through traffic. But if you have more time, stay on Arkansas 16 and wind through more wilderness. Eventually, you'll reach an intersection with state highway 7, also known as the main scenic route in Arkansas. This road connects the lake resorts in northern Arkansas with Hot Springs National Park. It's a nice afternoon of driving that most passersby simply miss. Honorable Mention: Natchez Trace Parkway, Tenn.-Miss. There are plenty of well-traveled traffic lanes connecting Nashville with Natchez, Miss. But the most rewarding route is the Natchez Trace Parkway, which touches national forests and a variety of Native American historic sites. It would be best to pack a lunch for the swing through Mississippi. Restaurant choices are few, but picnic opportunities are plentiful around every corner. The Natchez Trace Parkway can be included in Nashville or New Orleans itineraries in which there is a spare day or two. It's a nice change from the urban tempo. One important word to the budget-wise traveler: watch your speed carefully, because police officers all along the route will also be watching it for you. That 45 MPH posted speed limit is strictly enforced.